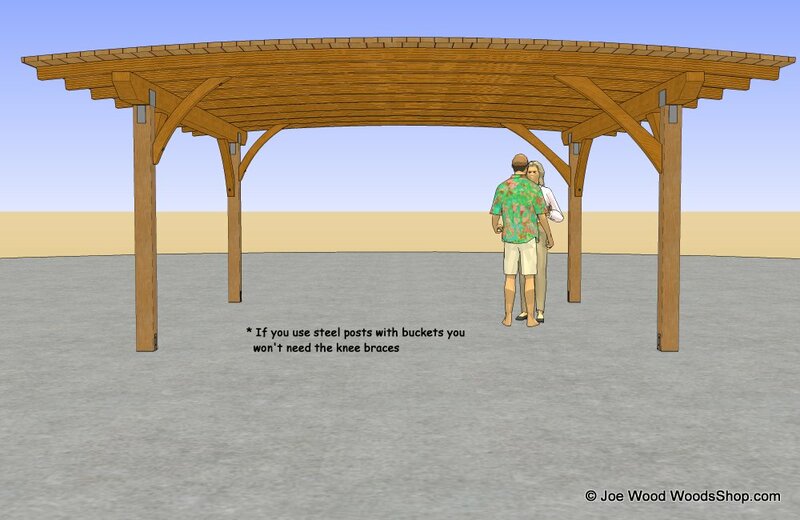 So a customer would like a curved roof structure next to their pool here in San Diego, and I have a few questions. This will need a permit, so for the adhesive I'd use either plastic resin or epoxy. Which glue would cost me less? Could anyone help me estimate how much I'd need? There are 9 beams, each with 5 1x4s. What type of epoxy would I use if I go that route? since this would be structural I'm thinking I'd use doug fir 1x4s instead of my usual wr cedar. The fir I can get is still pretty wet, would this be an issue for the laminations? here are a few conceptual images to give you an idea on the structure. That thing is going to cost a few bucks. I would be inclined to have an architect spec it to keep you out of any liability issues. If that's not in the budget, I would be slightly concerned. I could be wrong, but I believe that epoxy is okay outside, but not inside because of fire and the low melting temp(200 F) of epoxy. Brands of epoxy: West System, System 3, and MAS epoxy. There are a several other semi generic brands. All are good. Most people use West System because of availability and the medium viscosity. MAS is the most user friendly and cost effective, but not as available. Doug Fir is strong, but not rot resistant. I would try to stick with cedar or redwood if possible. The customer should have enough money to pay for proper design. Do not do this because its a "cool" project. They could always scale down the spans and size or do without the curves. All of those features drive up the cost by orders of magnitude. Nice drawings and design. You may have to get a engineer or architect to sign off on it in order to get a permit depending on your location. Thanks Adam, appreciate the advice, especially about the liability! I'll probably go with the plastic resin glue. I called Dap and found out the coverage and these 9 beams up would cost about $70 for the glue, not bad at all. I'll go with the cedar, and explain the probable need for an engineer or architect. 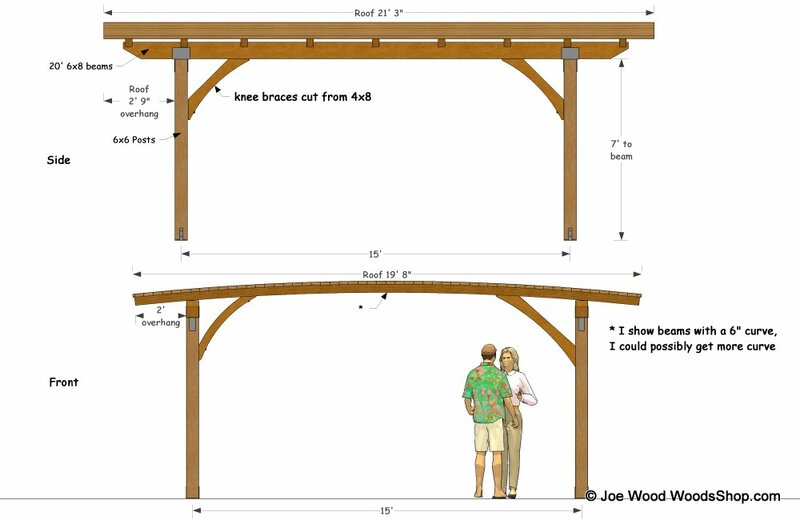 I did another laminated beam job quite a few years ago using redwood 1x4s and the original TBond and it held up fine. 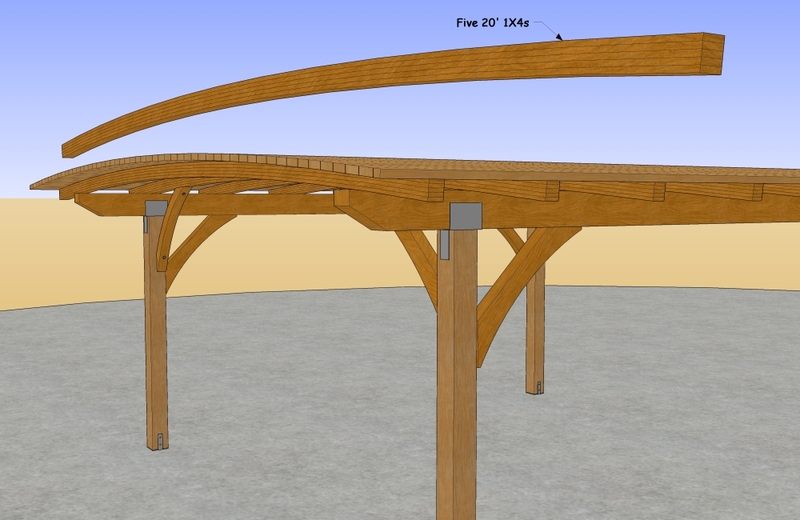 Cedar doesn't have much structural strength, and can be brittle around knots. You should check with the adhesive folks if their glue likes cedar or redwood because of the oils in the wood. I agree with Adam, hire an licensed engineer to do the calculations. There are two issues that need to be addressed. First is the strength of the wood. Although you do not need high strength for snow or roof components, you do need strength enough for someone, now or in the future climbing on the top, perhaps for maintenance or as a joke. Cedar and redwood are not strong species. At the same time, you need to avoid species that might decay, especially at the joints where water can be trapped. If you use pressure treated, then special fasteners must be used as well. Second, we need to consider the durability of the adhesive subject to uv, heat and moisture. Special epoxy formulations are needed to avoid uv degradation. The adhesive must withstand wetting...some are called moisture resistant, but you need more protection. The adhesive must also be rated for construction use. For example, TB is not as it will slip too much...it is not rigid enough. Most often we use phenol or resorcinol based adhesives. Due to liability issues, you do need advice from a professional on both species and adhesive. Some pretty impressive work on your site Joe.